Hi friends! I hope you're having a great day! I'm having a few issues right now. :( I wonder if I can just will myself better? I guess I'll try! Here's a card I made for a challenge over at Cosmo Cricket. You can read about it HERE. It's a perfect challenge for me since I am a chipboard HOARDER! I will buy a ton if I find it on sale. 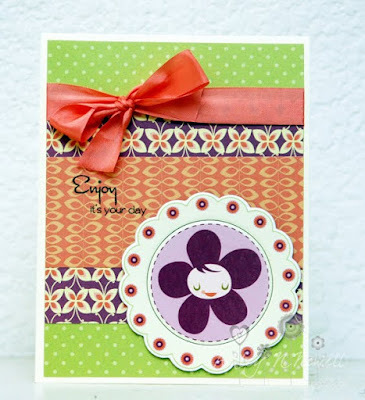 It's just so easy to make a card with chipboard. So, I dug out my Cosmo Cricket Pixielicious. I always forget how much I love a collection when all the new ones come out. Just look at these gorgeous colors! The stamp is from My Thoughts Exactly Mini Thoughts. These MTE stamps from last release are SO easy to use! I reach for them all the time! I finished this card with some seam binding. I made this card using Mojo Monday sketch #236.
whew, I'm not the only chipboard hoarder:) Love the card. The colors are amazing.